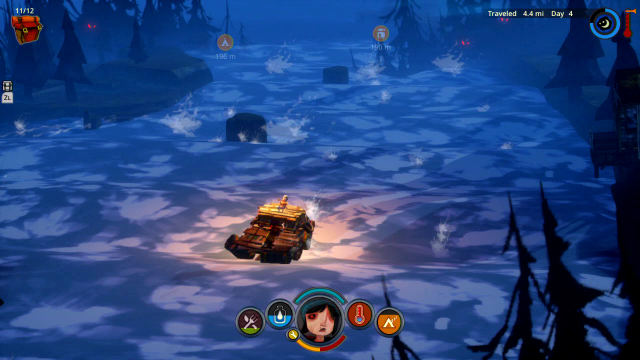 The Flame in the Flood Review: Buy, Wait, or Skip? The Flame in the Flood is a gorgeously stylized survival game that takes the trappings of rogue-like games and morphs it into a combination of nearly every other survival game you’ve ever played, frustrations included. There are some interesting choices that make the game worth exploring if you’re a long-time fan of the survival genre, but for everyone else, there’s a frustrating experience hidden below this beautiful gem. I admit that I have a love/hate relationship with survival games. 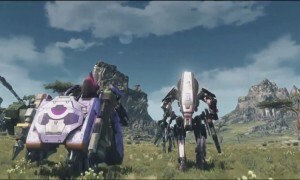 Theoretically, I like the idea of being pitted against nature in a one vs. one setting with only my wits to keep me alive, but in practice, most games end up dealing you a cheap death that feels wholly undeserved in a game where making progress is about painstakingly clawing your way up the ladder of gameplay. The Flame in the Flood starts out like any survival game, with you and your trusty companion alone in a flooded wilderness that’s been ravaged by some apocalyptic event. Digging around you’ll find a few things that you can craft into other useful things and then you’re on your way down the river, managing rapids and trying to find new places to stop to gather gear. The river itself should present an obstacle or challenge in reaching the next area for survival, but in reality, it feels like a boring mini-game that you have to pay attention to before you can begin the real survival aspects of the game. The river doesn’t feel dangerous. Aside from a few scrapes to my raft before I got the motor for my boat, I never really felt like the river was a challenge and that’s a problem when you spend most of your time on it when navigating to new areas. The areas on the river are randomly generated to try and spice things up, but the very restricted inventory your character starts with turns loot gathering into an exercise in patience. Since you only start with 12 inventory slots and much of the game is spent crafting items to help you along your journey, you can’t be willing to grab everything useful unless you know you can craft it into something later. 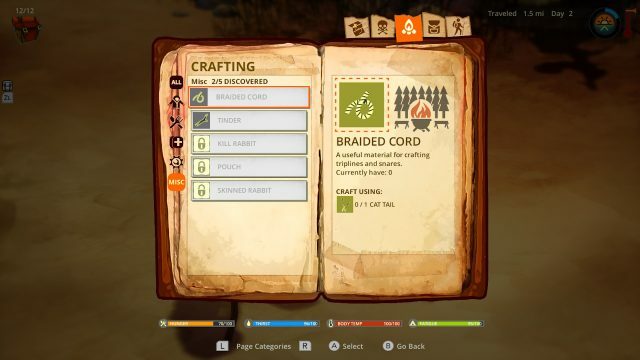 Your furry companion and the raft itself have inventory as well, but it’s irritating that the items they’re holding don’t show up in the quick crafting inventory for use. I found the resource management to be irritating and not fun, which is half the draw of a survival game. There’s so much crafting available that managing your inventory becomes a chore to do, rather than an enjoyable experience in crafting new things to help you survive in this beautiful world a little longer. 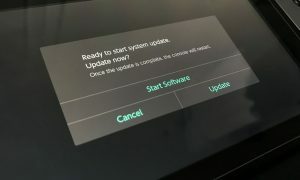 Part of the frustrating experience is that the essentials feel as though there is no rarity to them. The game makes a big deal out of creating water filters to help you drink the polluted river water without becoming sick, but every time I started a new game within a day or two it was raining and I could collect fresh water in my jar. I never needed to use water filters because water was always plentiful. Encountering wildlife randomly in the game without being properly prepared is pretty much a deal sentence, until you figure out the trick to dealing with boars, wolves, and bears with spike traps and the bow and arrow. After being mauled to death a handful of times by boars and wolves, soon I was expertly dispatching them with crafted spike traps. And soon the fauna element of the game felt like a chore, rather than something new to overcome. You can predictably dispatch boars and wolves with two spike traps and bears with three once you aggro them with the bow and arrow. The fun gets sucked out of the challenges quickly when you realize this. There are a handful of randomly generated “quests” you can pick up at mailbox caches that are littered around the map as you explore, but these are usually simple crafting quests that require you to do a specific thing at a specific place. Once those tasks are completed, you have to wait until you find the next mailbox cache to get your reward. The soundtrack for the game is very fitting and I enjoyed it, but halfway through I ended up turning the music off completely. The country and western vibe is an amazing background for this game, but it grated on my nerves after the fourth or fifth time of me starting over after running into a mishap with a boar or encountering a bear not enough traps. It’s perfectly serviceable music and it is well done and fitting for the game, but it wasn’t my thing and so I grew tired of it before I wanted to finish the game. While I enjoyed the stylized aesthetic and music of The Flame in the Flood, I have to say this game is firmly in the Wait category for anyone but the most die-hard survival fans. The current price of $14.99 feels a bit steep for anyone who is likely to get frustrated by the early deaths and the repetitive nature of the survival game, especially when the game itself is so light on story. Of course, the point of any survival game is to enjoy the meat of the adventure until you reach your untimely demise, but the beautiful world of The Flame in the Flood doesn’t make up for how empty the gameplay feels, especially when a core mechanic of the game is exploiting how easy food is to find and how you’re able to dispose of the few predators who present a challenge with ease once you learn the tricks. 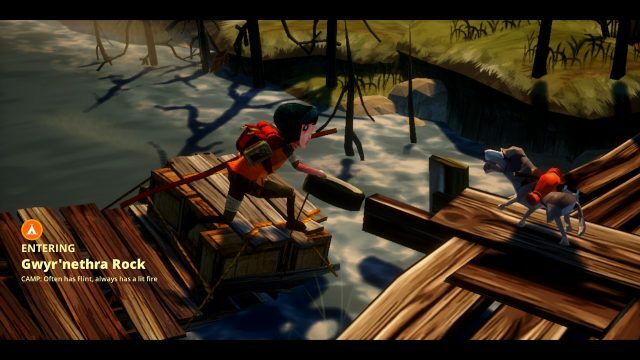 Perhaps I’ve been spoiled by the ease of inventory management in survival games like Don’t Starve, but I found The Flame in the Flood to be an exercise in tedium rather than something I would turn to when I had a spot of extra time to play the game. It’s an aesthetically gorgeous game, but I don’t feel like it would be fun for anyone except those who absolutely love clawing their way up the survival ladder time and time again.